Brown hamburger, crumbling into small pieces. Add onion, taco seasoning, and water. Stir five minutes, or until water is absorbed. Pour hamburger into separate container. Spread 2 tablespoons of enchilada sauce on tortilla. Spoon 1/6 of hamburger onto tortilla. Roll up tortilla tightly and lay in dutch oven. Pour remaining sauce over tortillas in dutch oven. Sprinkle remaining cheese over tortillas. Try to pack the enchiladas close together. Cut one or two in half to fill in the edges. This helps keep the sauce spread over all the enchiladas. 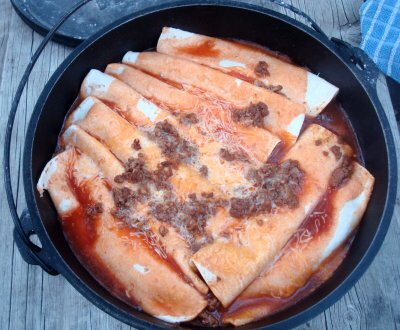 It's very easy to double the recipe and make a second layer of enchiladas in the dutch oven - lay them crossways to the first layer. Let me know how you enjoyed your Enchiladas!